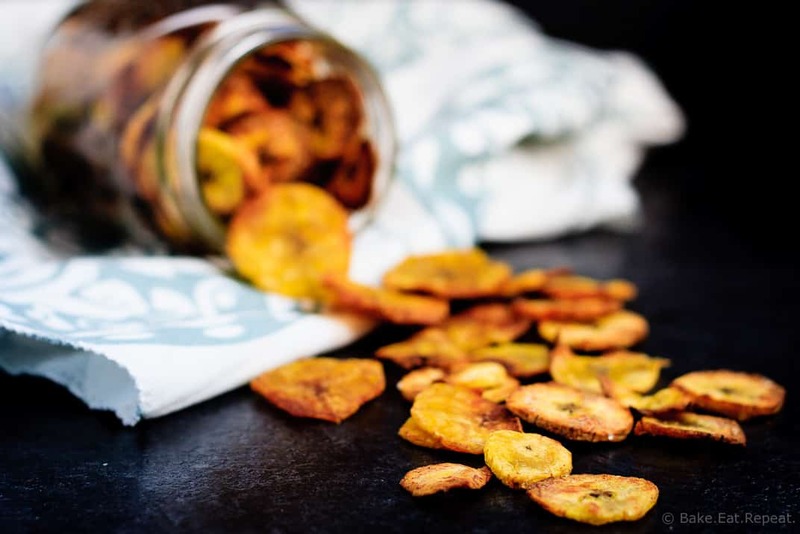 These quick and easy to make plantain chips make the perfect snack. So easy to make this crispy, crunchy and healthy snack! 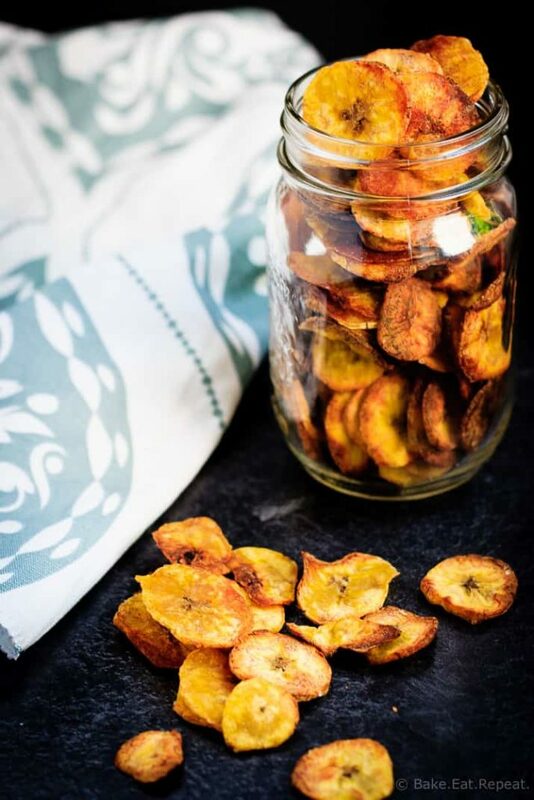 I can honestly say that I have never bought a plantain before making these plantain chips. Now I can also say that I will definitely be buying them again. We are always on the lookout for new and different snack foods around here. I have three children. They’re always hungry. Always. Sometimes I feel like I spend all of my time either making snacks, handing out snacks, or cleaning up from one of the snacks. Something about growing I suppose? They need to eat? At any rate, I love when we can find a snack food that’s fun and seems like a crunchy junk food chip, but is actually just fruit. That’s a win. Well, when they like it. My boys loved these plantain chips. My daughter, not so much, but then, she doesn’t really like banana chips and these are basically the same thing. I thought the flavour was a bit different from banana chips, but they are very similar. I happen to love banana chips myself, so I ended up eating most of these before the kids could even get to them. Clearly I like snacking too. But that’s okay when it’s something as healthy as this. To be completely honest, the first one I ate I thought, meh – these are okay, but nothing special. And then I had another, and another, and before I knew it the batch was half gone and I figured I better snap some photos because clearly, I like these! They were super easy to make, but I did find that it was really important to slice them as thinly as possible. The ones that were a bit thicker stayed a bit on the chewy side which we didn’t enjoy. The really crunchy, crispy ones though? Those were amazing. I would recommend using a mandolin to slice them if you have one to get nice thin and even slices. That would work the best. Or, if you don’t have one, like me, just slice them as evenly as you can, and cook them until they’re nice and crunchy. Just make sure to watch them at the end of the baking time, because the amount of time needed really depends on the size of your slices, and they go from perfect to completely black very quickly, as I learned the hard way with one pan of very black plantain chips! These are a great option for a healthy snack, and they were wonderful on their own, or dipped in avocado hummus or guacamole. Enjoy! 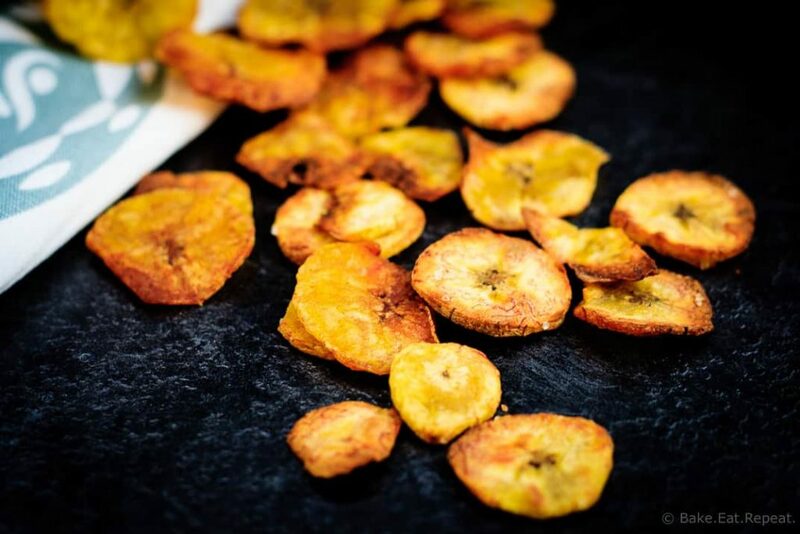 I’ve also shared this plantain chips recipe over on Food Fanatic! These chips look so delicious and remind me of Costa Rica, they eat so many plantain-based dishes there! I've never been to Costa Rica (or eaten plantains before! ), but we really enjoyed these! Yes we get plantain chips in India, I have always liked them :) I am always up for healthy snacks! looks delicious Stacey! These would be the perfect snack for me to munch on at the office! Love them! Yes! Healthy and crunchy, it's perfect! Thanks Katalina! I've actually never tried plantains but I always eye them at the supermarket. These look delicious! I've never really known what to do with them either, but these were wonderful so I'll be getting them again! Thanks Liora! You don't even know how happy this post makes me! I love plantains. If they are on the menu when we eat out, I order them. I've never had plantain chips though. But I do know that I would love them. I can't wait to try these! Funny, I've never even SEEN plantains on a menu anywhere, and I've never eaten them! But these chips were super tasty so now I'll have to see what else I can use them in! Thanks Jen! I've really only seen them at Cuban restaurants. And once I happened upon them at a Chinese buffet. Plantains are the best! You will have fun experimenting with them. 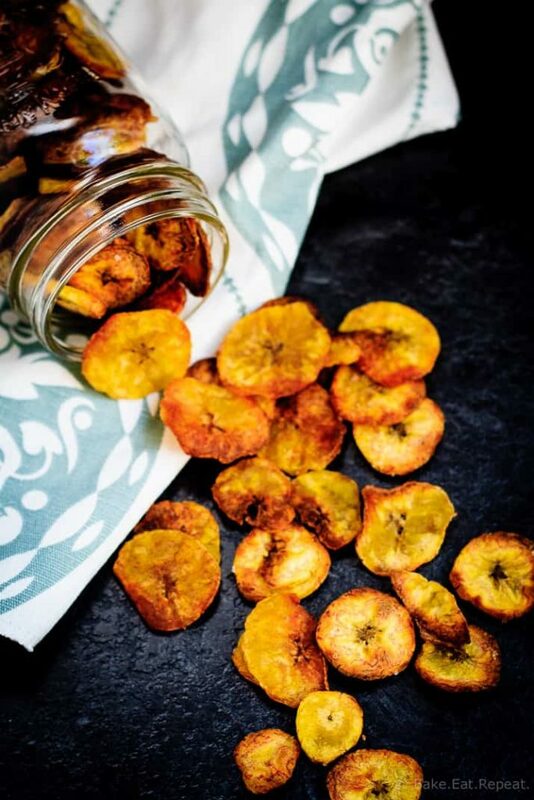 I've never thought to make plantain chips before, Stacey! This is so creative! Sounds like the perfect snack to munch on during the day! My sister-in-law is from Ecuador, and she introduced my family to plantain chips when she joined the crew. She makes really good ones, and she even taught the caterers for her wedding to make them! You're right: they're totally addictive, in a sneaky way. And yours look really perfect! They're SO addictive - it was funny, I honestly didn't think I liked them and then could. not. stop. eating them! Thanks Mir!